Peter David is one of the best writers any Spider-Man has ever known. Period. 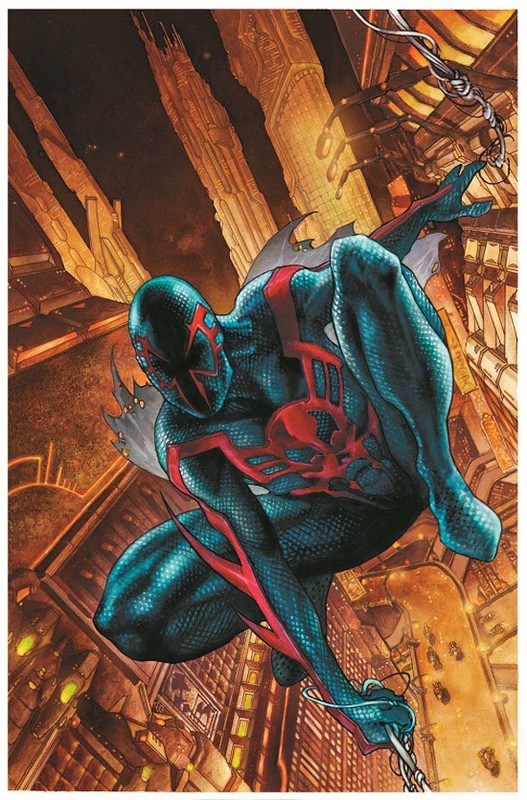 Not only was his stint on Web of Spider-Man one of the franchises best, he also made sure when Marvel launched it's 2099 line, that the company's flagship character was still way out in front. Now he gets to combine the styles of Web and Spider-Man 2099, writing a new ongoing series featuring the futuristic wiseguy, Miguel O'Hara, set in the modern world. Joined by artist Will Sliney on the July debut (with covers by Simone Bianchi), the series will see a stranded in time O'Hara undercover in the employ of mega-corporation Alchemax. Determined to try and transform his grandfather, Tiberius Stone into a decent guy in the hopes that it will wind up informing the raising of Tyler Stone, and perhaps make him a better person, he'll attempt to change the course of his future and prevent the rise of one of his greatest villains. To say I'm excited about this is an understatement. I could skip. In fact I'm going to right now. I'm right there with you man! This news made my day, my week, my year! I am SOOOOO excited for this. My head may a'splode! In a time when we're all a little jaded over comics this comes as a delighted surprise. No one in the modern day if writers comes close to writing Spiderman like Peter David. OMG! This can't happen soon enough!! !